7:00am to 5:00pm, Monday to Friday. Closed Saturdays & Sundays. Do you offer a pick-up & drop-off service? Yes we do, within the local Caloundra area. What makes and models do you service? Will servicing my new car at Caloundra Motors void my new car warranty? No – Australian competition & consumer law gives you the right to choose where you have your vehicle serviced, as long as the repairer is properly accredited & follows the manufacturer’s logbook requirements. What does taking my vehicle to an RACQ Approved Repairer mean to me? As an RACQ Approved Repairer, you can expect from Caloundra Motors a high standard of customer service, value, and workmanship. Work carried out by us is also backed by a 6-month/10,000km warranty. I am not an RACQ member, can I still bring my vehicle to you for servicing and/or repairs? Yes definitely. Anyone is welcome, it just gives you that extra peace of mind knowing that our business complies with RACQ’s exacting high standards. 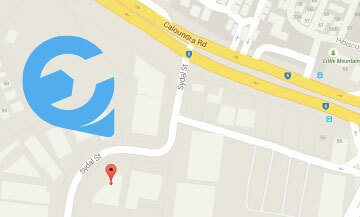 To learn more or to book your car in for a service call us today on 5491 1097. Booking your next car service online is quick and easy. Click on the booking button below, complete your details along with your preferred service date, and one of our friendly service team members will be in touch. We have used Kings Beach Service Centre for 30 years and have found them to be polite and obliging to myself and whole family with no complaints. Their professionalism and quality of workmanship is of high quality and we would recommend them to anyone in the community. "Just wanted to let you know how good it has been dealing with you and your team over the past 8 years. It’s never been too much trouble for you to drop me to work when my car is being serviced and pick me up when its ready. Not being mechanically minded it is always good to know that I can trust you to give me the best advice and look after me and my family. Having a successful business like yours and keeping it as personalised friendly and a family business is a credit to you guys. Many thanks"
"We have been getting our vehicles serviced at Kings Beach Service Centre for well over 10 years now (both business and private). We find their work ethic to be exceptional and have nothing but praise for Glen, the Workshop Manager and his wife Leisha for their good old fashioned customer service where nothing is too much trouble. We would highly recommend them as an honest and reliable business to deal with." © 2018 Caloundra Motors Service Centre. All Rights Reserved.